Yarn Type A super soft blend of extra fine merino wool and baby alpaca. The yarn has a soft marl colour effect and is quick to knit making very wearable, warm and lightweight. 65% Wool 30% Alapaca 5% Polyamide. Hand wash warm. 4 designs knitted in Brushed Fleece designed by Martin Storey & Lisa Richardson. 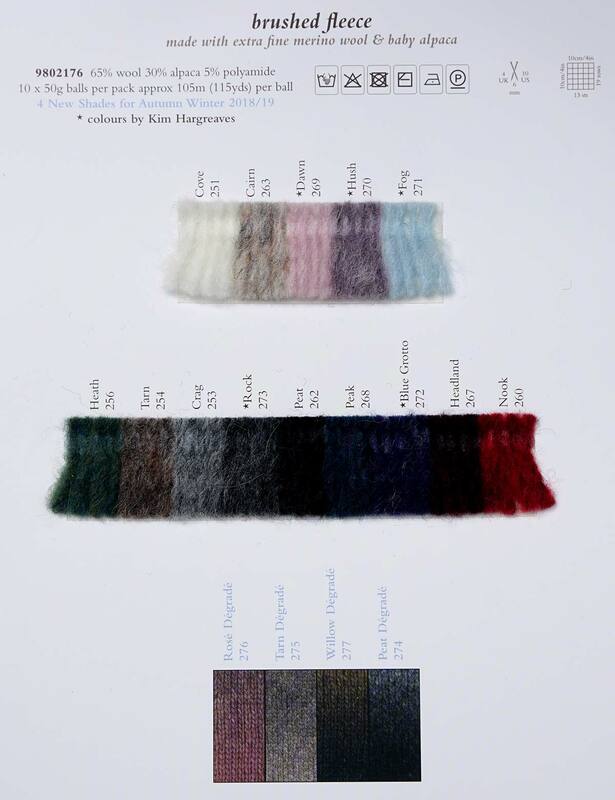 A collection of 8 designs by Quail Studio for Rowan using Big Wool and Brushed Fleece, two key yarns for autumn winter. Classic styles and textured stitches: from your go to boyfriend sweater to something a bit more sophisticated with an off the shoulder design. Photography is styled with a casual look alongside something more formal. This collection features 8 designs from Quail Studio for Rowan. Designs include stylish accessories, cardigans and sweaters for the perfect cosy wardrobe staple.8 handknit designs using Brushed Fleece. 4 handknit designs for Rowan from the Quail Studio, featuring some of Rowans most popular yarns. 16 designs by Martin Storey using Rowans Brushed Fleece. A collection of beautifully soft and featherweight Autumn/Winter knits for both men and women, all knitted in Rowans new yarn Brushed Fleece. These knits are all extremely light and cosy to wear. Outdoor trend-knits that are essential cover ups for cooler days spent walking along the beach in winter. This 16 piece collection features cocooning wraps and shrugs, voluminous capes, sweater dresses, classic long & crop cardigans, soft cables all in a richly-coloured, dark winter palette. Knit this ladies garter stich block poncho, available as a free pattern to download. Designed by Sarah Hazel using the super soft yarn Brushed Fleece (extra fine merino wool and baby alpaca), this cosy yet lightweight poncho would make the ideal winter warmer. This simple festive wreath brings a contemporary Christmas feel to any door. Created in soft neutrals and injected with a bit of sparkle, this wreath with various sized pompoms has been made with Brushed Fleece, Fur and Anchor Artiste Metallic. However, this stash-busting project would be great to use up any leftover Rowan yarn, so have fun experimenting.